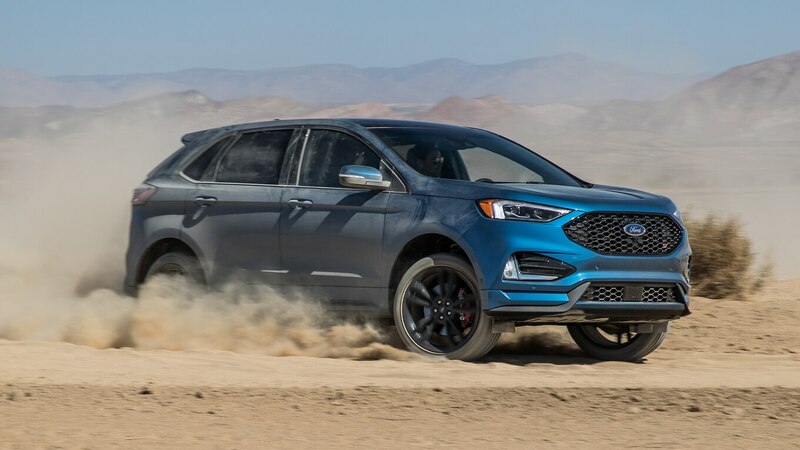 Not what I was hoping to hear about the 2019 Ford Edge ST. I’m not at all opposed to the idea of high-performance SUVs and crossovers. In fact, I enthusiastically voted the Alfa Romeo Stelvio Quadrifoglio winner of just such a comparison test recently and strongly endorsed its entry in Best Driver’s Car. When Ford announced the Edge ST, I was excited at the thought of bringing the wild and free spirit of the Focus ST and Fiesta ST to a crossover. That’s where things went wrong. Ford set a high bar for the ST badge. Both the Focus ST and Fiesta ST were also previously invited to Best Driver’s Car, where we lauded them for their personality. Each felt light and lively, with a tendency to rotate predictably mid-corner, which made them great fun to toss around a back road. You wanted to drive the wheels off either of them, but you knew you wouldn’t because despite their liveliness, they were completely controllable and confidence-inspiring. Out of the box, controllable and confidence-inspiring are the only traits the Edge ST shares with its predecessors (aside from the badge). It has lots of grip courtesy of Pirelli P Zero tires and standard all-wheel drive, so much so it’s completely buttoned down. It grips and goes, which is fine, except that it has none of that ST liveliness. Rather than light and playful, it’s heavy and all business. Aha! But wait, you say, there’s “relaxed” stability control mode! Or, you could just turn it off! Yup, that’s true, and it helps. With one of the stability control’s hands tied behind its back (it’s never entirely off to prevent you from rolling the vehicle), the rear end will rotate a bit in a tight corner. Here again, though, it’s very clinical, like it was programmed to allow only a single-digit percentage of fun. Just getting there requires you to drive very carefully to avoid inducing understeer before the fun starts. It’s not an excited puppy begging you to play like the Fiesta ST, it’s an American Kennel Club purebred waiting to be told what trick to perform. Rather than pull from the established ST playbook, then, the Edge ST is much more analogous to the larger Explorer Sport. In creating that model, Ford fitted a bigger motor, included standard sport-tuned all-wheel drive, upgraded the brakes, and tweaked the shock absorbers. Sound familiar? The Edge ST receives Ford’s 2.7-liter twin-turbo EcoBoost V-6, standard sport-tuned all-wheel drive, big brakes, and stiff shocks. With the stability control on, it even drives like the Explorer Sport: big, a little heavy, lots of grip, and not a lot of personality. Or, the opposite of a Fiesta ST. This all starts to make sense when you remember the Edge ST replaces the Edge Sport in the lineup. That V-6 makes 20 more horsepower and 30 more lb-ft of torque now, but you wouldn’t know it from the test results. The Edge ST hit 60 mph in 6.1 seconds on 91 octane, just one-tenth of a second quicker than a 2016 Edge Sport running on 87 octane and four-tenths of a second slower than a 2015 Edge Sport drinking premium gas. 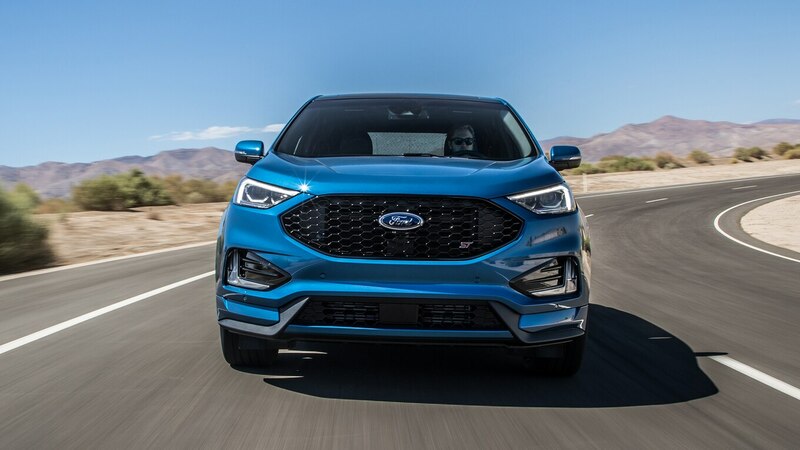 In the quarter mile, the Edge ST records the same 14.7-second elapsed time as the 2016 Edge Sport, but slightly faster at 93.4 mph versus 92.9. The ST is still eating the 2015 Edge Sport’s dust, with its 14.3-second run at 95.9 mph. There’s more to it than the handling, though. 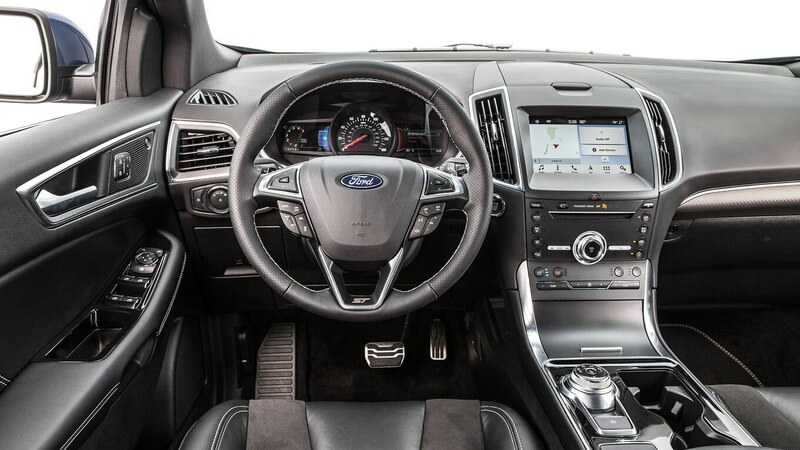 The new eight-speed automatic generally performed well, but it occasionally drops hard, clunky shifts and responds to the paddle shifters when it gets around to it. The brakes are strong, but after our testing they were stuttering at low speeds as if they’d warped. The performance shocks ride very, very stiffly on bad pavement and allowed a bit of early Focus RS–type pogoing mid-corner when pushed hard. Despite that, the ST delivered on the figure eight with a lap time of 26 seconds flat at 0.70 g average, beating the zippy 2015 Edge Sport in speed but not grip (26.2 seconds at 0.72 g average) and the 2016 Edge Sport all around (26.4 seconds at 0.64 g average). The ST also eked out a win on the skidpad with 0.88 g average, just besting the ’15 Sport’s 0.87 g average and the ’16 Sport’s 0.85. It was a much more decisive win for the ST in braking, in which it needed just 108 feet to stop from 60 mph. Both Sports needed 120 feet, nearly a car-length. 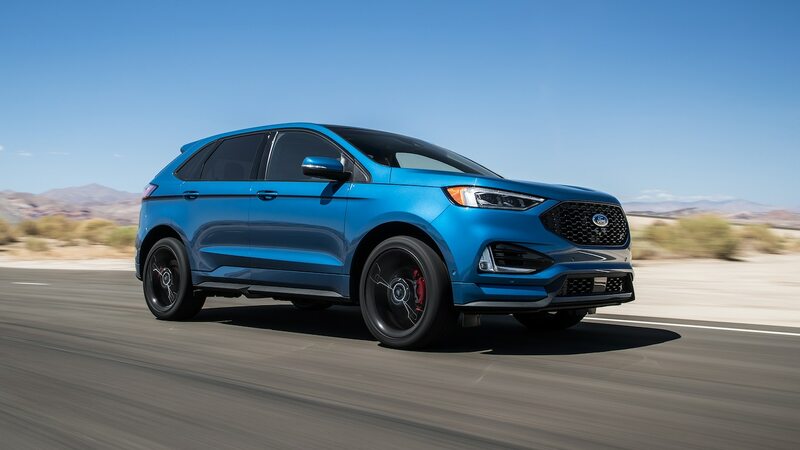 The new Ford Edge ST, then, is not a big, blue, all-wheel-drive Fiesta ST but instead an Edge Sport with better brakes and a hooligan mode. Not a wild and crazy 20-something hooligan, though. More of a “young parent who needs a more practical car but still wants to drive something sporty” hooligan. It’s still cool, man, but it’s got responsibilities now. The post 2019 Ford Edge ST First Test: Lowercase st appeared first on Motor Trend.